We can recommend four scenic walks around the parish, from a 30 minute tour suitable for wheelchair users and pushchairs; up to a challenging 7 mile countryside adventure! Don’t forget to keep an eye out for hidden treasure! For more details, please see Public rights of way and countryside access. There are also plenty of walks in the Cambridge area to enjoy. Five buses per day, Monday to Saturdays, to and from Cambridge. Visit A2B Website or contact them. One bus a week to and from Royston (Wednesday only). Call 01763 243225. There are no bus services after 7pm or on Sundays and Bank Holidays. Finding the correct bus stop can be difficult so we have provided a basic map below. National Express 787 between Cambridge and Luton/Heathrow/Gatwick via Harston. Operated by National Express Coaches 0371781 8181. Cambridge Dial-a-Ride is a charitable organisation which provides transport for groups and individuals who otherwise have difficulty accessing public transport. It offers this service on week days in the City of Cambridge and the villages, including Haslingfield. More changes to local bus services! Stagecoach have now completely abandoned our village. The 26 is no more. Our own service 75 that has been run by Whippet for years and years is now operated by a relatively new bus company A2B Bus and Coach Ltd. This is a small local company that is growing fast. As well as the 75, A2B runs the 31 Cambridge to Barley, and the newly extended 7a Trumpington P&R to Whittlesford & Duxford. The 75 timetable is the same as before and although the buses are older than Whippets, the service has improved. Timtables are being posted at bus stops locally. The once weekly service 15 to Royston on Wednesdays is unchanged. All these routes survive by virtue of subsidy from Cambridgeshire County Council. which is in the process of being updated. Or go to the Bus Timetables page of the Cambridgeshire County Council website. Please support your local bus services and help reduce traffic congestion in the area. Much has changed recently in field of the rural bus services. The Travel and Transport page of the Haslingfield Village Website has been updated. Cambridgeshire is a county of villages, which are poorly served by Public Transport. Most bus services are commercially run. Those close to a major bus route, or one several railway stations, are lucky. For the rest of us who can’t or prefer not to drive, cycling, walking or using expensive taxis (or perhaps relying on the generosity of neighbours to provide lifts) a good bus service is vital. As well as the No 15 (just one bus a week to/from Royston) and No 26 (one service each day through Haslingfield, but mostly through Harston), the No75 is ‘our’ bus. The route is funded entirely by local government grant. Last year the net cost of running the service was £96,000. Each passenger journey was subsidised by £5.34. It is a vital link for many and it continues to be at risk of withdrawal. More passengers will reduce the subsidy make loss of the service less likely. The page has lots of useful links to routes and timetables, as well as a handy map guide to bus stops around the village. Does anyone know whereabouts on the high street the bus stop for the ’26’ service is? Going from Royston to Cambridge. Sadly this is not an unusual occurrence. Whippet have sold their 95 year old family bus business to Tower Transit, which operates in major Australian cities. More recently it bought into the UK London bus network by purchasing three strategic ‘First Bus Group’ depots. Interestingly, Tower Transit were involved in the Adelaide guided busway. It remains to be seen how this newcomer to public transport in Cambridgeshire will affect the hitherto virtual monopoly which Stagecoach enjoy at the moment. A revised timetable for the 75 will start on 26th July. It is not clear if this is a result of the recent rural bus consultation, or just tinkering by the new owners of Whippet. 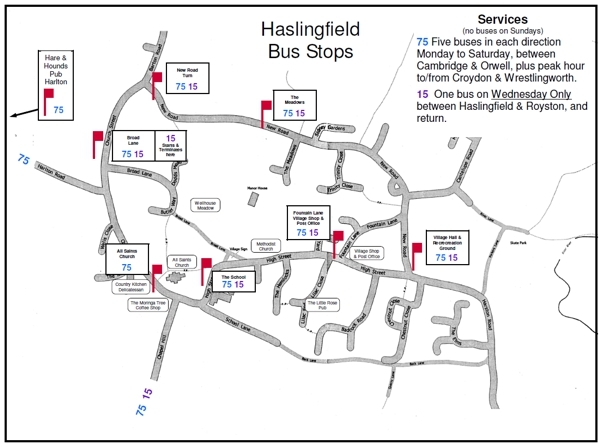 Yesterday, my plan was, to catch the no.75 bus from Cambridge Bus station to Haslingfield. (My Son and family live in Haslingfield) . Therefore, before my visit, had looked up times and thought I would arrange to get the 16.00 hr from Cambridge bus Garage. However, while waiting for Bus. I then confirmed times and the number from your Time Table next to Bay 4. Unfortunately for me, The 75 Bus never arrived and literally I was left stranded. and no one around to ask, is there an explanation ? Or did I look at the bus timetable wrong. ? There are at last some moves on the local bus changes, No75. To view all Reports related to our area you can visit the Cambridge Future Transport website at http://www.cambridgeshire.gov.uk/cft and click on ‘Working with the Community’ and scroll down to Area G.
Comments are invited, so please take time to read the options, and respond by Tuesday 30th September. It’s our bus, lets do our best to get it right! Sadly the confusion described by Donald Judge is not uncommon. Bus services in rural areas of Cambridgeshire have been neglected to the point where they cannot be relied upon. We are a mere 6miles from the centre of one of the most economically successful cities in the UK, yet accessing that city is for most ordinary people an expensive challenge. A convenient, well defined and fully regulated service is desperately needed. Until our elected representatives take this matter seriously, driving a car will be the only viable way to get around the area thereby perpetuating the traffic problems we know only too well. Total confusion with the 75 to Cambridge at 11.34 on 5.9.13 and 9.34 on 6.9.13 – not to mention the advertised 1820 from Cambridge on 5.9.,13, which never showed up!